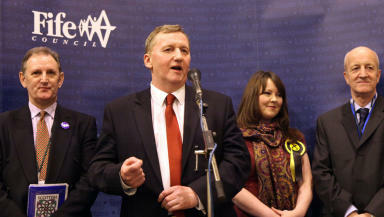 Fife Council leader Alex Rowley was declared the winner after taking more than 50% of the vote. Scottish Labour has held on to the Cowdenbeath constituency after seeing off a challenge from the SNP. The Scottish Conservatives saw their share of the vote rise while the Scottish Liberal Democrats fell into fifth place, behind UKIP. Labour took 11,192 votes, a share of 55.8%, while the SNP's candidate Natalie McGarry came second with 5704 votes, a 28.4% share. In his victory speech, Mr Rowley said: "This is about a bigger vision for Scotland, a bigger vision than simply independence. It's about full employment for every young person to get the opportunities that they deserve from their lifetime. "It's about elderly people living in Fife with dignity, and making sure when they need services those services are available. I will spend every day working hard to ensure that we do that. "Finally, the message has got to go out in the Scottish Parliament right now that we can mitigate the bedroom tax. "We can give people jobs, we can give people opportunities, we can do that with a strong, devolved Scottish Parliament working within the UK." Ms McGarry, in her concession speech, said: "In eight months' time there is going to be a referendum, and people in this constituency and across Scotland will have a vote. I am confident that there will be yes majority in September. "So Alex Rowley may be the victor tonight, but I believe the whole of Scotland will celebrate a yes victory in September." Scottish Labour leader Johann Lamont congratulated Mr Rowley, who becomes Scotland's newest MSP. Congratulations to @scottishlabour's Alex Rowley on winning the #Cowdenbeath by-election. The by-election was called following the death in November of incumbent Labour MSP Helen Eadie. The 66-year-old was elected to the constituency at the 2011 Holyrood election after having held the previous Dunfermline East seat from 1999. Dave Dempsey, who fought the by-election for the Conservatives, saw his party's share of the vote increase to 9.4%, with 1893 votes. UKIP's Denise Baykal took fourth place with three per cent -- 610 votes -- while the Lib Dem candidate Jade Holden came fifth with 425 votes, which represented a 2.1% share. However, both parties lost their £500 deposit because they failed to achieve five per cent of the vote or more. The Victims' Final Right, a single-issue party led by Stuart Graham, secured 187 votes and the Scottish Democratic Alliance, represented by James Trolland, won 51 votes. The turnout was 34.81%, down from the 46.9% showing in the May 2011 Scottish Parliament election. Appearing on STV's Scotland Tonight by-election special, senior political figures debated the significance of the result and whether the independence referendum had played any role in voters' choices. Scottish Government health secretary Alex Neil said SNP canvassers had found support for independence on the doorsteps of Cowdenbeath. Mr Neil said a party survey of 11,720 voters showed 41% in favour of independence, 36% against and 23% uncertain.